Nice callback to Torchic's Beta design. could you make a third evolution version of this? This is actually pretty nice if Nintendo went with this route instead of going the basic Fire/Water/Grass starter choice, where in each generation you had to choose what of the three different typing but instead of what it used to be it's now "Do I want Treecko since he's an Ice type and would later evolve into an Ice Dragon type, or should I stick with Mudkip since the first gym leader will be a Rock type gym and there's also Torchic who I could use for the second gym leader" and so on and so forth. Kind of puts in a bit more strategy to the game instead of just relying on Fire/Water/Grass or "Which of these three looks the coolest/cutest/dumbest"
I Love Your Variation of The Regional Pokemon Starters. Hello! I really like these regional variations and I'm creating a free Pokémon fangame, would you let me put some of them in the game? Obviously giving you credit. Can't wait for 3rd stages! Bulbasaur: When they are young, they maintain their high core body temperature by bathing in pools of magma. If their body temperature drops enough, the magma within them will cool and become unusable until it is reheated. After some time, they can maintain this body temperature on their own. Charmander: They reside on the bottom of riverbeds, feeding on the plants growing there. If ill meaning intruders infiltrate their territory, they will repel them by releasing a high pressured blast of water. Squirtle: Typically mischievous in nature, they often lurk in trees, curling into their shells and dropping down on to unsuspecting Pokémon or people. If the victims have any food or anything else of value on them, they will often find these things gone upon waking. 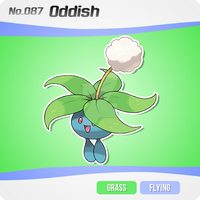 Chikorita: They dream of being able to fly, looking to the skies and desperately twirling the feather on their head with the hopes of getting airborne. Despite mostly resulting in failure, there have been documented cases of this working. Cyndaquil: The gem on Cydaquil's back is extremely valuable and highly sought after. Due to being poached to near extinction, they are now protected, only professors and those these professors deem worthy able to legally own them. Totodile: There bite is renowned for being even more powerful than that of a normal Totodile. If enough effort has been put into it, these Totodiles can bend metal using their jaws, something which these Totodiles apparently enjoy doing to make their bite more powerful. Because of this, people have begun to give the wild Totodiles scrap metal so they don’t damage any property. Treecko: A single colony can live in a single dead or frozen tree for an entire year, feeding on the twigs and branches of the tree for the time they reside their. The tree will be completely consumed upon the year’s end, after which the colony will seek out a new tree in the winter that follows, repeating the process. Torchic: Despite not looking it, the small wings on their heads are actually very powerful. They are able to use them to fly, allowing them to fly with surprising speed if frightened. Also, if they feel threatened, they can use these wings to deliver a strong blow, dazing foe giving them enough time to flee before the foe can regain their bearings. Mudkip: At a young age, they use the hard fin on their head to display their emotions, rubbing the front of it against those they care about to show affection while giving a slight bump to show annoyance or anger. At adulthood, their fin becomes even harder and the more rambunctious members of their specie will ram against one another, either to play or in competition for a mate. Turtwig: This breed of Turtwigs' development is unknown. Some think that it all stemmed from a single Turtwig that was abused by a cruel owner, the sheer malice they felt in response changing it into the new form. The prevailing theory however is that they were the product of repeated breeding with dark types, resulting in the variant. Chimchar: There is a particular forest in which these Chimchars are native to. Any who enter this forest, be them human or Pokémon, are said to experience strong illusions, ranging from the overly goofy to the shockingly horrifying. Some may not even return, and some that have didn’t return the same, trapped in an endless illusion. Oddly enough those that are stuck like this, seem to be extremely happy. Piplup: Extremely prideful, they often compete amongst one another in order to prove their superiority over the others. The more mature of their specie will often recognize the strongest of the group and may even let it be one of the leading members of their colony. However, if one is too strong or too reckless, they may be exiled from the group by their leaders, either because they threaten their own leadership or the safety of the colony. Snivy: They are almost always vain, refusing to leave their snowy habitat for fear of getting their skin dirtied. They are also very high maintenance, looking down on their fellow Pokémon and feeling that they should get all the attention from their owner. Because of this, modest members of their specie are sought after, being much more cooperative and manageable. Tepig: These Pokémon love any form of mud or dirt. If there’s one around, you can be sure there’s a puddle of mud nearby. Despite doing this simply out of enjoyment, apparently their attachment is instinctual, cooling them off if the weather is too hot. Oshawott: They work daily to make sure the edges of their shell are battle ready, but also not sharp enough to deal permanent damage to those they fight. If it does not meet their standard, the Oshawott will work through the night to make sure it is perfect. Chespin: Their fur is very soft and pleasant to feel, a trait the specie itself knows about and will use to bond with others. However, when threatened, they can make their fur harden and fold down, forming a metallic armor to protect them. To attack, they will ram the spikes on their head into the foe. Fennekin: Upon hatching, they will find a twig and keep it from then on. They will use this twig to channel their still developing powers until they become skilled enough to control them on their own. Even after this though, most will continue to use their special twig and if they lose their twig, they will frantically search for it until they find it or a worthy substitute. Froakie: They live near ponds, guarding any Pokémon in their area from harm. If there is a disturbance, the Froakie will take it upon itself to solve the issue. Rowlet: Their migration schedule is the opposite of that of other bird Pokémon, chasing the winter weather. Those that do stay behind though have not shown to be effected negatively. Litten: They abhor being cleaned, disliking any moment in which they don’t have dirt on their body. The reason for this, despite appearing merely as a rebellious trait, is apparently as a means of defense, shaking off the particles to make a cloud to temporarily blind an opponent. They can be taught to not do this, but trainers often encourage it. Popplio: Being one of the few rock types that live in the water, they have to be cautious around particularly temperamental water types. In order to ensure they are not in danger, they will often attempt to ally themselves with or befriend other water type Pokémon. 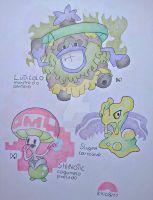 Those accompanied by a Chinchou or Lanturn are found often times to be more confident than others. SO, apart from the first two sets of starters, these regional variants are weak against the opposite pokemon when compared to the original. Other than Piplup, who's my favorite Pokémon, I fell in love with Chespin. It looks so awesome and cute! These names are great! Not only are they very appropriate for the type changes, but they're fun to say too! Cute are you going to do there 3rd forms? THESE ARE PERFECT I COULD CRY!!!!!!!!!! These are real awesome. (But too many fighting) I think the Totodile fighting type is really good though. I'd have a different opinion of using chimchar if he were psycic. He's been one of my least favorite starters ever. I'd probably give Chikorita a try, too. these are great! love the cyndaquil, tepig, froakie, and chimchar best! I love how the rowlet looks like someone dumped flour on him XD I do like all of the designs and I can't wait for the third one! If there will be one? I like the idea, you did great work! I love them, and this means we finally have that fire turtle that I always complained about! Right? Fighting already has so many starters it ought to be just plain culled from the starter typesets. Cachomon's doing a contest for regional variants that, if you haven't already looked into, I think you should. Judging from how well you've done with these, you'd be quite good at it! 1) What is the Contest about? 6) Things I forgot to say! The line marked with a is what stage is the Event at the moment! I see what you did there with Torchic, using the its beta design as a base. I really enjoy these immensely. Can't wait to see more! Cool! I really like the Chimchar! nice.. so many of the water types became fighting though. I think Totodile and Oshawatt would be my favorite out of these variants. I appreciate the homage to Torchic's concept art as well.